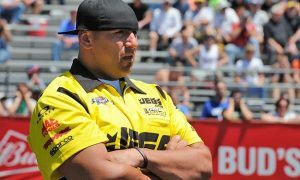 GLENDORA, Calif. – Justin “Big Chief” Shearer, star of Discovery Channel’s reality television series Street Outlaws, plans to compete in his Pro Mod car in the Chevrolet Performance U.S. Nationals Aug. 31-Sept. 5 at Lucas Oil Raceway in Indianapolis. Shearer recently appeared in an NHRA public service announcement encouraging hot rod enthusiasts to race at NHRA tracks, and not illegally on public streets. Shearer filmed the PSA while attending the NHRA Summernationals at Old Bridge Township Raceway Park in Englishtown, N.J. where he met with several NHRA stars and spoke to many fans. Shearer’s PSA was an important message about the dangers of illegal street racing. Getting racers off the streets was the core ideal for Wally Parks when he founded the NHRA in 1951, promoting racing on dedicated racetracks that provide a controlled environment. For decades, NHRA has worked with law enforcement and public officials to move drag racing off city streets and onto dragstrips. Shearer is busy filming the final episode of the eighth season of Street Outlaws while also preparing his Pro Mod car for the necessary changes needed to compete in the “Big Go” in a few weeks.